This book light has 3 kinds of lights to meets your different needs. Built-in rechargeable battery provides long working hours. The flexible gooseneck can be adjusted on right position where you want. Rubber pad on the neckband is anti-slip and can hold steady on your neck. You are free to carry this flexible book light in your pocket and carry around. It is perfectly suitable for reading book in bed or garden, walking dog, table working, camping, crafting, etc. 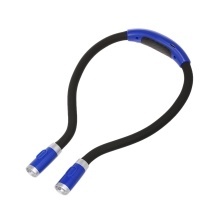 4 LED high-brightness lamp beads support three-gear light adjustment. One is flood light, the other is spot light. With one button on each side of the light, control 3 levels of cold light, meet your different needs. Built in rechargeable battery, provides long time working hours. Four types of power supply–5V adapter charging, laptop USB interface charging, power bank charging and car charger charging. The goose neck is flexible to be adjusted on right position where you want. Rubber pad on the neckband is anti-slip and can hold steady on your neck. On the neckband, there is a LED light shows charging status clearly. Red light means charging, green light means fully charged. Lightweight and flexible, carry it around as you like. This book LED light is perfectly suitable for reading book in bed or garden, walking dog, table working, camping, crafting, etc. It is a good choice for your daily life.